Everything you need to know about Marvel Battle Lines, releasing today – AiPT! Battle on a board with more Marvel characters than you can even recognize. It’s finally here! If you checked out our demo from New York Comic Con, you know we’re psyched for the wide release of Marvel Battle Lines, the newest mobile game from Nexon. Yes, it looks a lot like tic-tac-toe, but where the symbols have superpowers and can beat the crap out of the other symbols. Collect a bunch and build a deck. The thrill of a CCG without the wrapper waste and buyer’s remorse! 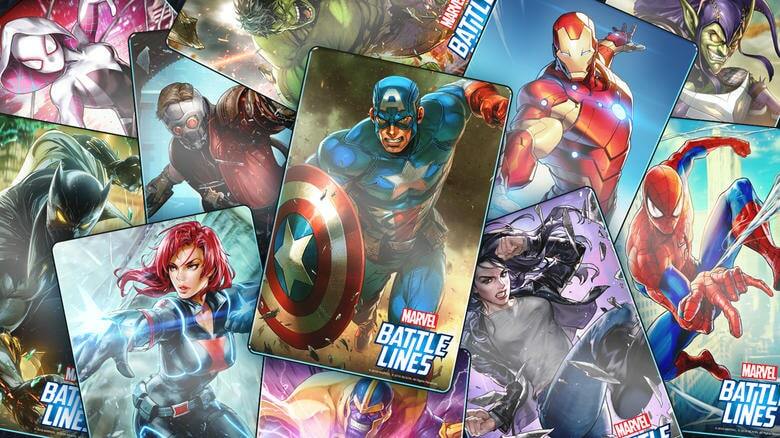 More than any other mobile game, Marvel Battle Lines is a love letter to the comics themselves, with artfully arranged story material and 100 different characters available at launch. Look at just some of the awesome images available, 200 in all! Marvel Battle Lines is available on iOS and Android today. Read on for the full press release. EMERYVILLE, Calif. – October 24 – Nexon and Marvel have launched MARVEL Battle Lines, a strategic card battle game featuring hundreds of iconic Marvel Super Heroes and Super Villains, to mobile devices worldwide. The gameplay experience of MARVEL Battle Lines is set on a unique 3×4 grid, where players will compete with a custom deck of 12 character and ability cards and deploy them to the battlefield in order to defeat their opponent. MARVEL Battle Lines features an extensive single-player campaign with an original story crafted by Marvel writer Alex Irvine, real-time turn-based player vs. player (PvP) mode, limited time story events, and much more. Marvel fans can download MARVEL Battle Lines for free on the App Store for iPhone and iPad and on Google Play for Android devices. MARVEL Battle Lines‘ intuitive gameplay allows players to battle in single player and be competitive in PvP from day one. Following the tutorial, players will begin to collect cards from each battle in the single player and PvP modes. Players can build diverse decks of 12 cards featuring an array of powerful Super Heroes and Super Villains as well as a range of unique powers and abilities. Players must master a deck’s strategy and upgrade their cards to take on greater challenges in the story modes and to compete with the best in PvP. In addition to the campaign featuring an original story from Marvel writer Alex Irvine, an array of single player activities will revisit Marvel storylines and events and continue to challenge and reward players. MARVEL Battle Lines can be downloaded on the App Store for iPhone and iPad and on Google Play for Android devices. For more information on MARVEL Battle Lines players can visit www.marvelbattlelines.com and visit the official Twitter and Facebook pages.